I've for an 11 week old DD that's keeping me busy! 1) He developed a nasty bite on the bootsock, I mean iron tight. I tried pinching the lip to the teeth and he would just scream but not let go. It was a real struggle to get it out of his mouth. I think this was the wrong approach. For starters you should stop trying to train an 11wk old puppy to retrieve and you certainly shouldn't be using any force techniques on it. Instead what you should be doing is bonding with that pup and helping it learn it's new world. Go for hikes in the fields and woods, explore, have fun. I'd recommend Joan Bailey's book How to Help Gun Dogs Train Themselves. It gives great insight into simple exposure work tbat will actually help you when it comes to formalized training further down the road. Use treats and praise and begin teaching your dog it's name and a good, solid recall. Actual formalized training, particularly hunt training like retrieving is way down the road. Let pup be a pup and I think youll end up with a much better hunting dog later instead of the path you're on at the moment. I agree, the intention was to be just a bit of fun. No forced used other than the light lip pinch which is recommended in Joan's book. Things went wonky when he wouldn't let go of that sock and it felt like it wasn't going the way it is supposed to, which is when I stopped to consult the experts! If your pup was screaming or helping it likely wasn't that light of a pinch and I don't think Joan recommends it for an 11wk old pup. Like I said, didn't feel right so I stopped. Hope I haven't done anything to damage his retrieve down the road. I think it’s important to use actual training tools and not the sock. Pup likes the feel (fur) of the sock and is reluctant to give it up. If you must continue (after a reasonable layoff of a couple of weeks or so) try a short knap paint roller. In the meantime, I might try some simple hold drills with some object that isn’t particularly comfortable to hold, like a 1” X 6” wood dowel. Offer the dowel with the command, fetch. Sit with the pup and let it hold a while till it looks like it’s ready to drop. Say, give and take the dowel. You always want the pup to associate dropping an object with the word give, no matter what, no matter where. Provide a reward that is better than the object given up, like a T-Bone steak. Training a dog is all about word association related to an activity. draht1516 wrote: Like I said, didn't feel right so I stopped. Hope I haven't done anything to damage his retrieve down the road. Nah, most dogs are resilient. Particularly Wirehairs. But I would focus on bonding and exposure for at least the first several months and name and recall. You want pup coming to you because you're fun to be with, good things begin with you. If you want an item pup has use a treat. A good piece of hot dog is generally a tastier treat than the averagel dog treat. If pup decides to lick something up and eventually brings it over to you, praise and treat. Let him carry it for awhile though if he wants. Orhunter, did you catch the part about the pup being only 12 weeks old? Fetch commands, dowels? Draht1516, a little fetch with a puppy is a good thing in my eyes. Use your small bumper. Pitch it out and let pup go. As soon as he picks it up, say his name or make some noise to get his attention. The moment his eyes find you, turn your back to him and take off the other way. I betcha he will come boiling after you. Now spin around and take a knee and grab him up. Don't worry about trying to get the dummy. Love him up and let him know what a good dog he is. When he gives it up, fire it right back out. Same thing when he grabs it. Stop after a few retrieves, before he tires of the game. Leave him wanting it. Nurture and build on his natural desire to retrieve right now. 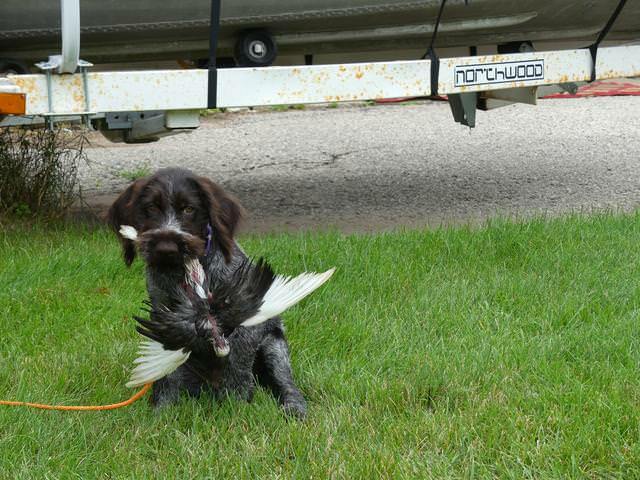 The time will come to work on a trained retrieve, but not yet. You have some good advice here and there is nothing wrong with spending time with a new puppy. Just so you know if you didn't do any training until the dog was 6 mo. old, by the time the 2 dogs are 8 mos old they will perform at the same level. Said another way, athletic ability means a lot. The dogs are very smart and keen to make you happy but early training doesn't give the dog a lead over other good dogs. But playing with your new friend is great. There are lots of things you can teach him that make him a better pet. Let us know how he does in NA. I would NEVER not throw objects for an 11 week old pup to retrieve. Much possessiveness is caused by people trying to take the bumper too soon. That little guy just made a retrieve and he's proud of it. Try this. Throw a puppy bumper, paint roller, 6" dowel, etc. with pup on a 20', 1/8" check cord. Always, always, always, have the cc on the pup unless you're romping in the field with him. Now when he picks it up, YOU lay down and coax him to you with gentle pressure on the cc. When he gets to you, don't take the bumper. Let him prance around with it for 15-20 seconds, then coax him to you, quickly take the bumper and praise him. Do NOT let him run away, lay down, chew and ruin the bumper. With a pup you want to subject it to every stimulus and action he will encounter in the future and that includes the retrieve. Retrieving, pointing, swimming, exploring in the field; all of it. You can see from the expression that pup is thinking about NOT giving me that bird. I love puppies. I decided to take a little break from the retrieve "training" and instead clap my hands and encourage him to come when he has a toy or "treasure" to bring me, similar to Willie T's advice. I exchange it with a high value treat; so far so good. Going to try that approach with a bumper the next few days, keeping it fun and potentially incorporating some of gonehuntin's advice with a CC. Keep him happy, excited, let him chase butterflies or whatever...just don't worry too much at that age. I did and there was no good reason for it. I have struggles now (normal training hurdles) but I don't think any of them were caused by anything that I did before 6 months of age. I start my puppies play retrieving using homemade bumpers constructed of duct tape wrapped around the cardboard centers from toilet paper rolls. Extremely light and easy to carry. I have used hallways within my homes in the past and with my current pup, I constructed 20 yard long tunnel using plastic snow fence on one side, the wall of my machine shed on the other side and straw bales blocking off one end. I tease the puppy and toss the bumper. The puppy has only one direction to run with it and that is back to me. I let them keep it in their mouth a bit before taking it away and when I do take it, I toss it again immediately so there is no resentment and the excitement continues. I stop while the puppy is still excited and wanting another retrieve. When I stop I swing the bumper behind my back, out of sight and start walking away with the puppy free to explore whatever catches its interest. There is no verbal signal to the ending the play, I just move away from the tunnel and hide the bumper as I do so the puppy's attention easily moves onto some else. It keeps them excited for the next day's session. 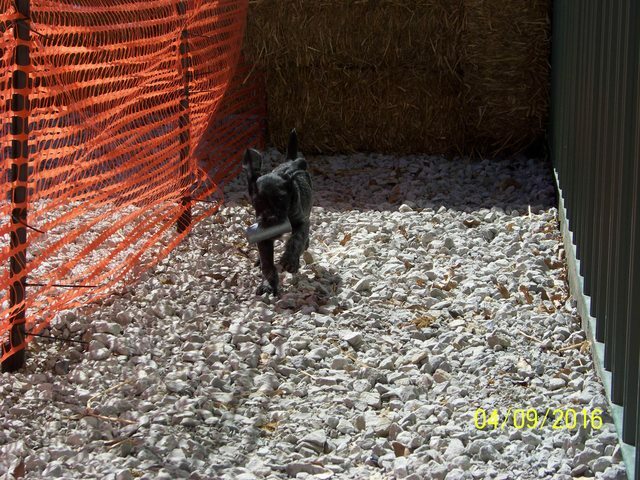 When I start working the puppy outside the tunnel I have it drag a check cord. If the puppy does not return with the retrieve object, I walk away in the opposite direction or even run a little and that usually works. If not and the puppy is playing keep away with the object, I get my foot on to check cord and the game ends. Usually with the early conditioning using the tunnel setup the pup is pretty good about coming back to me. When birds are introduced later, some possessiveness can show up and I keep things low key and fun when they do. Dragging the check cord always allows me to get my foot on it and gently get the object when I need to. And I will go back to tossing a cold bird in the tunnel if need be to get the same back and forth retrieve behavior we are after. No discipline all fun is how I approach play retrieve training.